Starting this month we are publishing a monthly article on a continuous improvement topic, with an accompanying resources page with resources, videos, and tools to support it. This month’s topic is Toyota Kata (TK) and the Scientific Thinking principles that lie beneath its improvement and coaching routines. Included in this article, and accompanying Toyota Kata Resources Page we hope you will bookmark, is a plethora of Toyota Kata information (PDFs, videos, articles, and podcasts) where we address what Toyota Kata, and Scientific Thinking, is all about including the back story and research that went into its formation. But, to start things off I’d like to share a personal story of how Toyota Kata and Scientific Thinking has changed my life for the better. 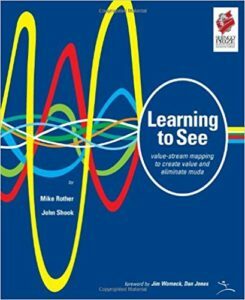 Like many lean thinkers the year 1999 was a major turning point in my professional career as Mike Rother’s Learning to See (LTS) book was published. To be sure, there are many lean resources and books that formed me into the lean thinker I am today. But there’s no doubt in my mind that Learning to See helped me lead more positive change than any other publication. In fact, Gemba Academy must tip its hat to Learning to See since we launched our company, in March of 2009, with a 12-video value stream mapping course that was heavily influenced by what I learned from this book. As my corporate career continued I kept learning as much as I could about all forms of continuous improvement. This eventually led me to the deep understanding of how important the human side of continuous improvement is. 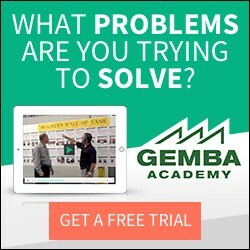 All of this experience definitely helped with the formation of Gemba Academy. But, my oh my, did I still have much to learn. In the early days of our company, one of the most common questions we received centered around where our customers should start. To be sure, with more than 1,000 videos in our library knowing where to start can be a daunting endeavor. Our initial response to this question was our own question – what problem are you trying to solve? This was better than nothing and it did help. But, deep inside our core, we knew this response was insufficient. We knew there had to be a better way to navigate the continuous improvement journey. 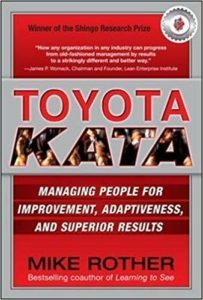 When Mike Rother published Toyota Kata in 2009 I bought and read it. But, for whatever reason I didn’t immediately give it the attention it deserved… probably because we were in the throes of starting a brand new company! But, as fate would have it, my slow start with Toyota Kata wouldn’t last long. You see, a few more years into Gemba Academy’s journey we began to field another question. People wanted to know where our Toyota Kata content was. The answer, of course, was aside from a few podcasts and blog articles we didn’t have any! We definitely believe in hearing, and responding to, the voice of the customer so we decided the lack of Toyota Kata content needed to change. But, one thing we’ve always tried to do is never teach something we have no personal experience with so we decided to deliberately practice Toyota Kata at Gemba Academy. And this, my lean friends, is when the fun (and discomfort) really started! Like anyone learning to think differently our early Toyota Kata days weren’t easy. We thought we knew how to grasp the current condition only to realize, no, we really didn’t. We struggled setting good target conditions. We also experimented with different Kata storyboards since some of us work virtually. Some worked better than others. Stop Trying to Solve So Many Problems! But I’m happy to say we worked through these early challenges and, eventually, found our Scientific Thinking legs. We also learned an extremely important fact… Toyota Kata isn’t a problem solving methodology. Sure, problems are often countered as a result of deliberately practicing the Improvement and Coaching Kata. But solving problems isn’t the primary purpose. The primary purpose of Toyota Kata is to think and learn. One might even go so far as to say that we lean thinkers would be far more effective if we stopped trying to solve so many problems and, instead, discovered how to learn faster. Put another way, that experiment you want to run shouldn’t be done in order to solve a problem. Instead, our purpose should be to see what we can learn. Perhaps the experiment will be a “success.” Great. We learned. Perhaps the experiment will “flop.” Great. We learned. Now, will problems ultimately be countered as a result of all this thinking and learning? Of course. But our effectiveness as lean thinkers ultimately lies in our ability to plan, make predictions, and learn. Finally, there’s often confusion about where Toyota Kata, and Scientific Thinking, fits into the lean body of knowledge. Is TK another “tool” like 5S or Value Stream Mapping? Does it replace the use of A3s? Simply put, does Toyota Kata play nicely with others? The best way I know to respond to this question is to liken Toyota Kata to a strong, wise, horse. And this horse has its eyes fixed on a far off destination since it most definitely knows where it wants to go. So, the horse sets off on its long journey and eventually arrives at a large obstacle it can’t get around on its own. Luckily, the horse is pulling a giant wagon full of just about every problem solving tool imaginable and, with the help of its human friends, is able to use the correct tool to break through that obstacle. The horse then resets its eyes on the destination and continues the journey repeating this same obstacle breaking process whenever needed. And so it is for us lean thinkers… Toyota Kata is the horse. And all of our continuous improvement principles and tools are being pulled in the giant cart behind the horse. And when our horse arrives at an obstacle it’s our job, as lean thinkers, to pull out the correct tool in order to break through. And, make no mistake, depending on the obstacle we may need to experiment with several different tools and techniques in order to learn what actually works! On the Toyota Kata resources page you’ll find more detailed information on what Toyota Kata is and how it can benefit anyone, no matter what sort of work they do. We hope you’ll bookmark this information and use it a reference page. We plan to update the page with more information as we learn more. Before I go… I’d like to leave you with some final words of wisdom I learned from my good friend, and fellow kata geek, Michael Lombard who’s fond of saying… let’s all get busy and KTS! KTS, in case you don’t know, is short for “Kata that Sh*t!” Well said, Michael. Very well said.